Superconducting "Cooper pairs" of electrons have been split to create entangled pairs of electrons in a new device built by physicists in Finland and Russia. The device employs two quantum dots made of graphene. Although other types of quantum dots have been used for this purpose, the latest research suggests that graphene quantum dots should deliver long-lived entangled electron pairs that could be used in quantum computers. Entanglement is a quantum-mechanical phenomenon in which properties of fundamental particles are correlated so that making a measurement on one particle can instantaneously affect another particle – even across very large distances. In principle, a quantum computer can use this connectedness to perform certain calculations much faster than a conventional computer. Although practical quantum computers do not exist today, some potential designs involve using the intrinsic angular momenta, or "spin", of electrons as quantum bits (qubits) of information that can be entangled. Superconductors provide a ready source of entangled electrons because the Cooper pairs that allow these materials to conduct electricity with little or no resistance are in fact entangled pairs of electrons with opposite spin. Splitting the pairs while preserving the electrons' entanglement can be done simply by connecting ordinary metal wires to either end of the superconductor. If the set-up is just right, each wire will carry away one electron from a pair. However, it is more often the case that both electrons will end up going down the same wire. One way to boost the odds in favour of separation is to replace the wires with tiny blobs of semiconductor containing just several thousand atoms. These quantum dots have electron energy levels that can be set precisely by carefully adjusting their size. The two electrons from each Cooper pair can be guided to different resonant energy levels and separated as a result. This approach has already been exploited using quantum dots made from indium arsenide and, with greater efficiency, using carbon nanotubes. The latest work, carried out by Pertti Hakonen and colleagues at Aalto University in Finland together with Gordey Lesovik of the Landau Institute for Theoretical Physics near Moscow, instead uses quantum dots made from graphene. 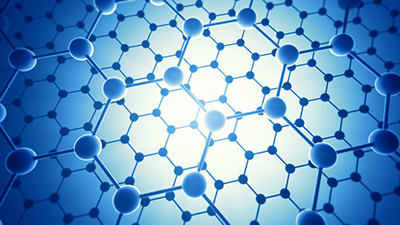 Graphene should be able to preserve the entanglement of the separated electron pair for longer, thanks to the fact that it consists of a single layer of carbon atoms, which constrains the electrons to move in a straight line and so avoids the emission of electromagnetic radiation that interferes with the spin state. 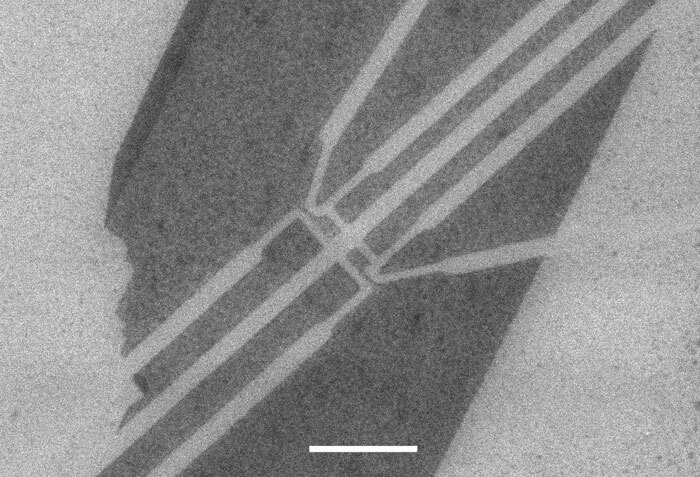 The team used electron-beam lithography to carve out two rectangular quantum dots (each 200 × 150 nm) from a layer of graphene deposited on a silicon-dioxide substrate. The dots were positioned 180 nm apart, covered by a superconductor made from a thin sandwich of titanium and aluminium, and connected to two metal contacts. To split the entangled electrons from the superconductor, the researchers first set the resonant energy level of the quantum dots to equal the energy possessed by the Cooper pairs. They then varied the gate voltage across one of the dots and monitored the current flowing through the other. They found that across most of the voltage range there was no current, but that at certain voltages the current would suddenly increase, drop below zero and then return to the zero mark. The rise, they explain, occurs because at that voltage the energy in one dot increases very slightly, while that in the other drops by the same small amount, causing the electrons to separate and so register a current (unseparated pairs register as zero current). The negative current, meanwhile, is caused by electrons "elastic co-tunnelling" through the superconductor. "It is like having a switch where you reverse the current by aligning the energy levels either symmetrically or antisymmetrically," says Hakonen. Venkat Chandrasekhar of Northwestern University in the US praises the team's ability to "independently control the energy levels of the two quantum dots", and so neatly distinguish Cooper-pair splitting from elastic co-tunnelling. Detlef Beckmann of the Karlsruhe Institute of Technology in Germany agrees, arguing that the group can "probe the mechanism of Cooper-pair splitting more clearly" than has been possible to date. "This is really a beautiful experiment," he says. There is, however, still room for improvement. Hakonen and colleagues are working to increase the device's efficiency – it currently splits just 10% of electrons passing through it – by better controlling the quantum dots' energy levels. They also aim to show that the device not only splits Cooper pairs, but that it does in fact preserve entanglement. They plan to do this by recording the spin of the separated electrons using contacts made from the nickel–iron magnetic alloy dubbed permalloy.